Sunday, December 15 1907 -- The top cartoon seems just a mite hypocritical considering that the Examiner has been celebrating the opening of Santa Anita all week, doncha think?. It's so good to have the Herriman LA Examiner cartoons here once again, Allan! Thanks for all the hard restoration work you do on these to make them easy to look at. Welcome back! 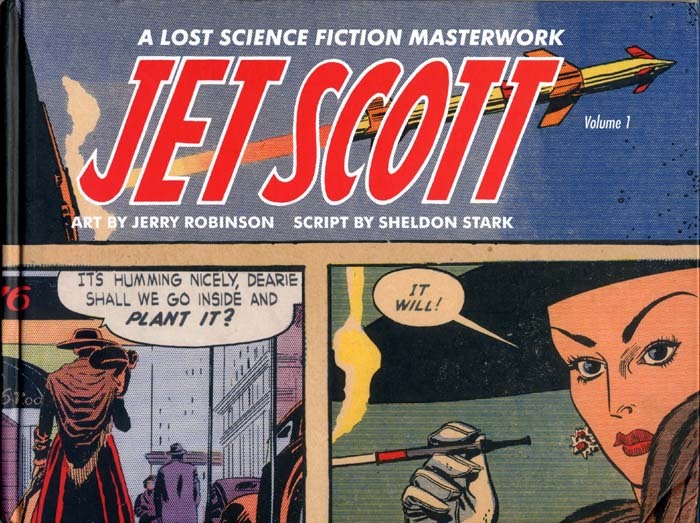 When I covered Jet Scott, a high-tech adventure strip of the 50s, as an Obscurity of the Day I called Sheldon Stark's scripts for the feature "well-written though disappointingly conventional". On reading the first story in this two volume reprinting of the strip I thought I was going to have to eat my words. "The Banthrax Incident" ranks as one of the most asinine and badly written stories I've ever struggled through in comics or otherwise. I won't go into details, but the thought that this is the story that sold the syndicate on the series just blows my mind. Fear not, though, because Stark's writing improved greatly in subsequent stories. Jet Scott is a troubleshooter for the Office of Scientifact who solves technology and science-based mysteries. The idea is a good one, though some of Stark's idea's about technology, especially computers, are real-knee-slappers. One of the cuter ones comes in that first story -- in order to find a professor who's gone missing Scott feeds his 'personality profile', his likes, dislikes, favorite foods and so on, into a computer. It promptly spits out the result that the misplaced prof is undoubtedly searching for the legendary Seven Cities of Cibola. Well of course! Even though that wasn't even fed in as an interest of his.We know it wasn't because Jet spends the next few strips trying to figure out what the heck Cibola is. Apparently he has a computer but not an encyclopedia. Anyway, this sort of cockamamie stuff is pure fun, with the advantage of hindsight we can snicker at such things. It really only added to my enjoyment. Less appreciated by today's audience might be that Jet Scott romances a new girl in every story, often making some pretty big promises about the future, and then each babe is promptly forgotten when the next story begins. It's pure fantasy stuff though -- do we object to James Bond doing the same thing? Jerry Robinson's slick art on the feature is shown to great advantage in the book. The dailies are all reproduced VERY large, bigger than they ever ran in papers. Sundays are decent-sized, too. The reproduction is generally excellent. The occasional daily obviously came from microfilm, but most seem to be either from proofs or good quality tearsheets. Restoration of the dailies is okay though my pet peeve about not fixing type lice and dropouts had me grumbling a bit -- not something you'd probably even notice if you don't do restoration work yourself. The Sundays are really impressive -- just enough restoration to bring them back to life, not so much as to make them garish. Very nice work. If you're interested in the Jet Scott two-volume series, be aware that the publisher apparently ran out of stock almost immediately. A mere few months after the books were published I went to purchase my copies and found that I had no choice but to buy a damaged copy on the used market. What's up with that? Checking Amazon now, though, I see they are available once again, but who knows for how long -- order yours quickly would be my advice. Here's a 1913 offering from NEA syndicate, the blanket service that was a popular supplier of features to smaller papers (and still is I guess, though this year it became an unnamed division of United Media). Deadshot Bill from Nurseryville offers little rhyming stories of a kid who likes to dress up and play cowboy. The sometimes eye-twitchingly bad rhymes are almost overshadowed (only almost) by the delightful art. 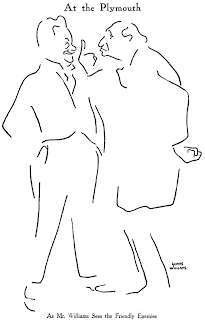 Fred Shaefer, a fixture at NEA whose name was variously spelt Schaefer and Shaeffer at times, has to accept the blame for the poetry. The excellent expressive art is by W. Aird MacDonald who did quite a few series for the syndicate in the first half of the teens. MacDonald did the art from the strip's inception on February 18, then handed off the chores to A.D. Condo who took over as of June 24th. The series ended on December 8. Love the artwork - nice post - went well with my coffee n biscuit. 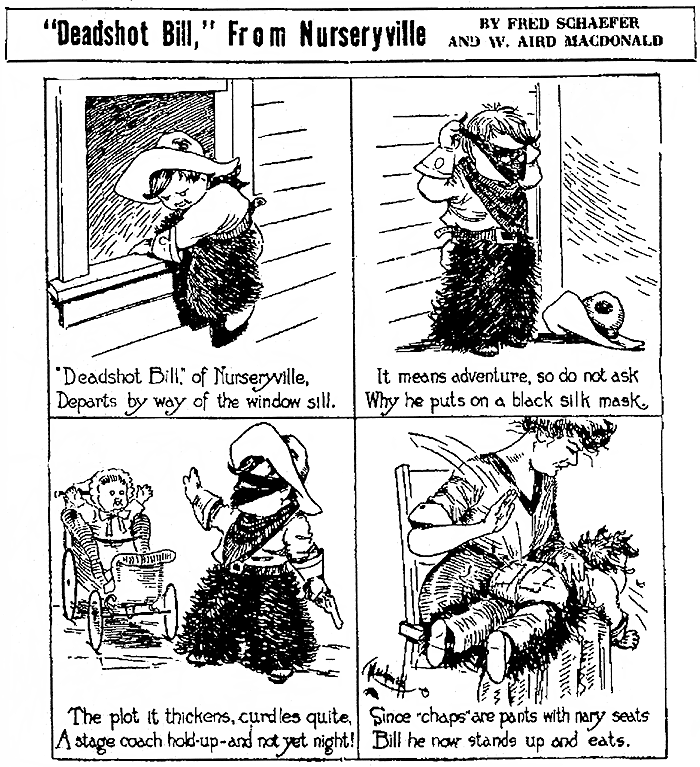 This strip ran from 18 February to 8 December 1913 in the Scripps paper THE TACOMA TIMES. Thanks for the Tacoma dates. Most of my NEA dates come from the syndicate archives, but the bound volumes for the mid-teens were a mess and I've had to make do with papers that carried the material for those years -- and they often run things late making for a real mess. Dates I gave were from Wisconsin State Journal. Animal strips, whether set in the zoo or the jungle, were a staple of early comics sections. Walter "Brad" Bradford, one of the funniest early newspaper cartoonists and incredibly prolific to boot, naturally took his swats at the genre. 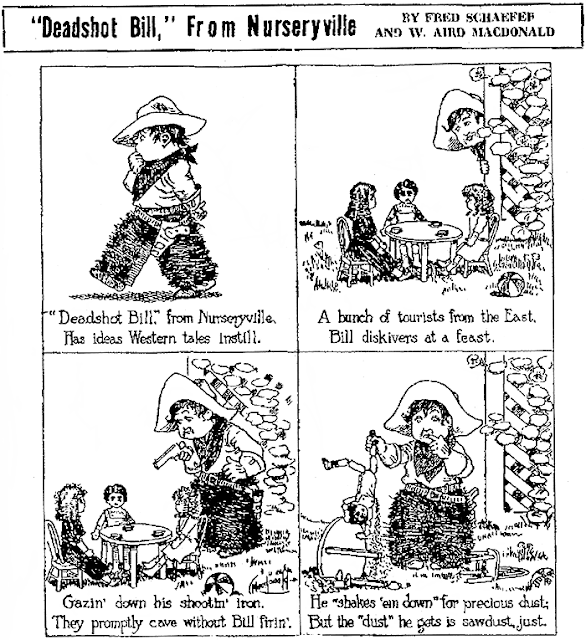 Brad kicked off the newborn Chicago Tribune Sunday section on November 10 1901 with three different comic series, one of which was Animal Land. 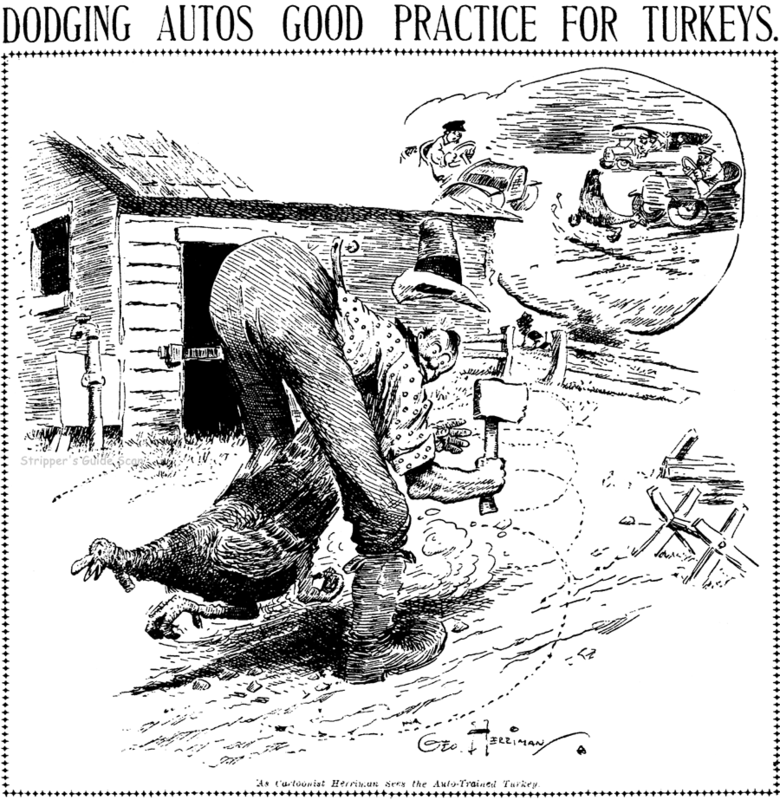 The series ran sporadically until January 4 1903, sometimes under the longer title of News from Animal Land. 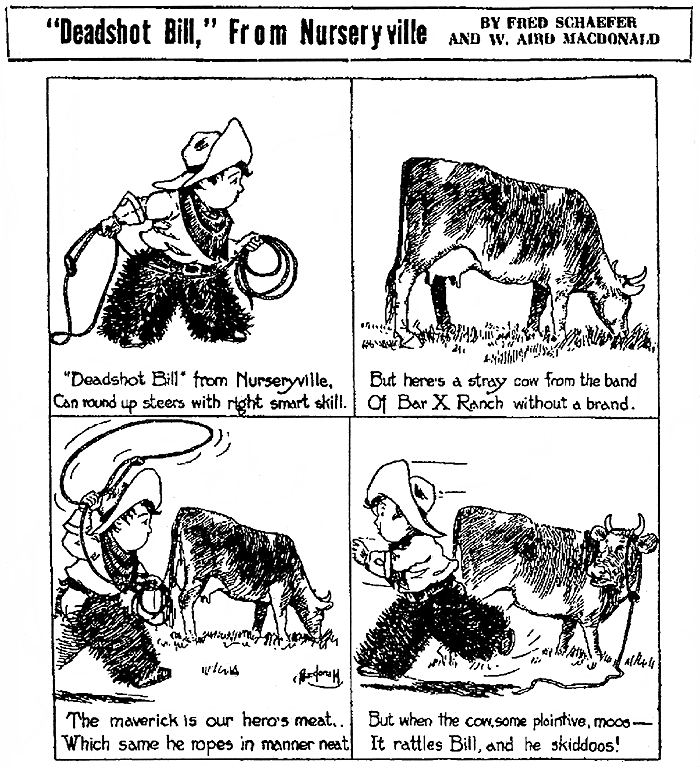 When Brad packed it up at the Tribune and took a position at the Philadelphia North American in 1905, an early act was to revive the old series there as Animalland. However, by this time the "been there done that" talking animal strip just was too constricting for his wild comic sensibilities. 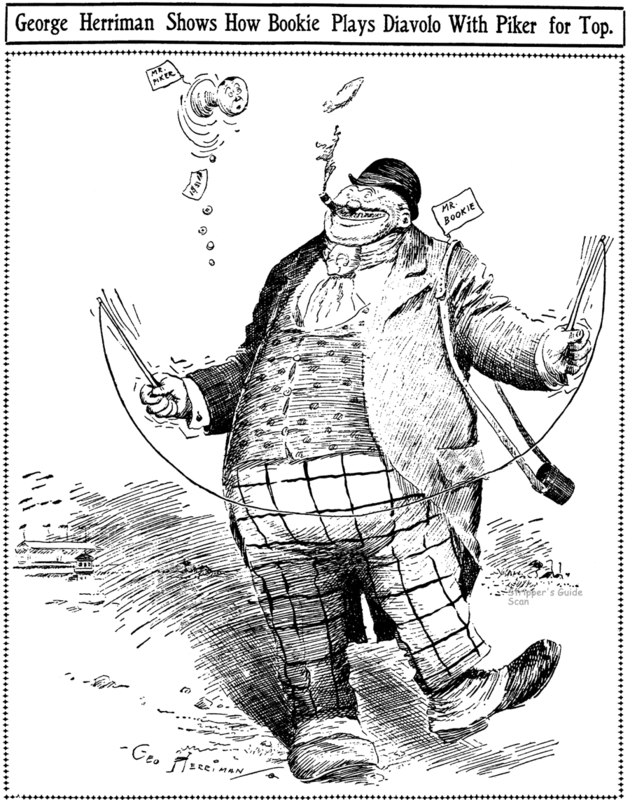 The feature ran only from July 2 to August 27 1905. Thanks to Cole Johnson for the sample strip! Hello, fellow comic strip fiends. Your Stripper's Guide host is back on the job as of today. I gave myself a few weeks off there because proofreading work and personal dramas got the better of me. But now, at least in theory, I'm rested, relaxed and ready to start making daily posts again, at least until the next crisis comes along. I'll spare you details of the personal stuff, but I want you to know that the preparations on my book American Newspaper Comics: An Encyclopedic Reference Guide, are coming along very well. The University of Michigan Press is doing a great job pulling it all together and the finish line is in sight. There's even a page for the book on Amazon now, though it's basically only a placeholder at the moment. Feel free to start submitting your rave reviews, though! Oh, you actually want to see the book first? Hmmph. Picky, picky, picky. 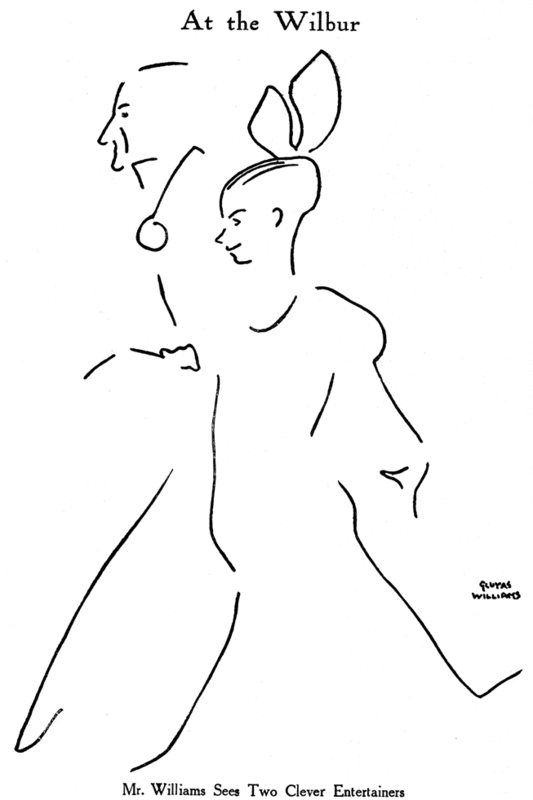 Well, I hate to make a post without a little eye candy, so here are some theatrical caricatures by Gluyas Williams. 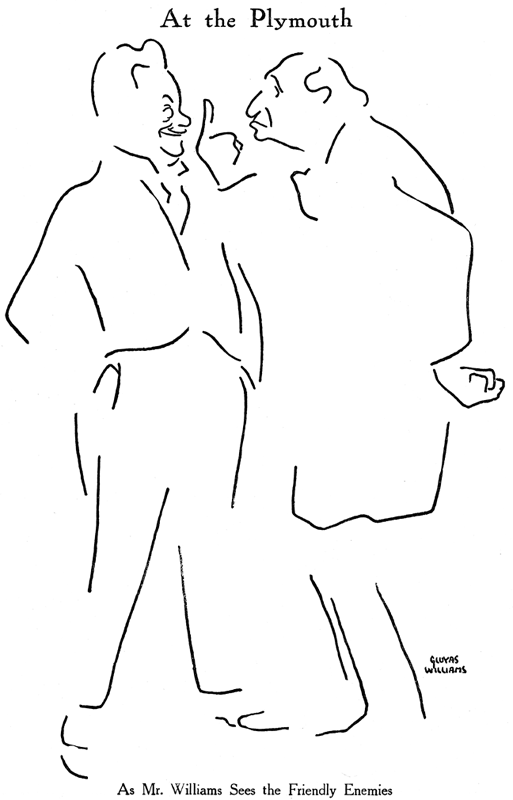 He did these in 1918. 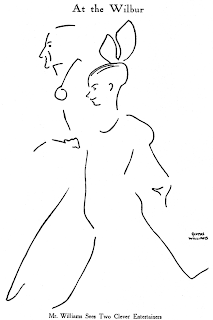 Although Gluyas was always noted for his economy of line, these are minimalist even by his standards. PS: My abject apologies to email correspondents who haven't received replies for awhile. Not only was I not making public posts, but much of my email went unanswered these past weeks. Great to see you back, Allan!----I was afraid you might have been hit by a meteorite or took the last train to Willoughby or ran off with Snookle or something....Cole Johnson. Glad to have you back. Do I pre-order from Amazon or is there another way to get more of the money your way? Thanks for being so considerate, but I'm guessing my cut doesn't depend on where you order. I'd be going with Amazon myself, that's a heck of a big discount they're offering, much more than typical for academic publications. Happy you are rested and back. I've been jonesing for some obscurities!